ok guys, I finally registered here after lurking around in the shadows for a couple years. 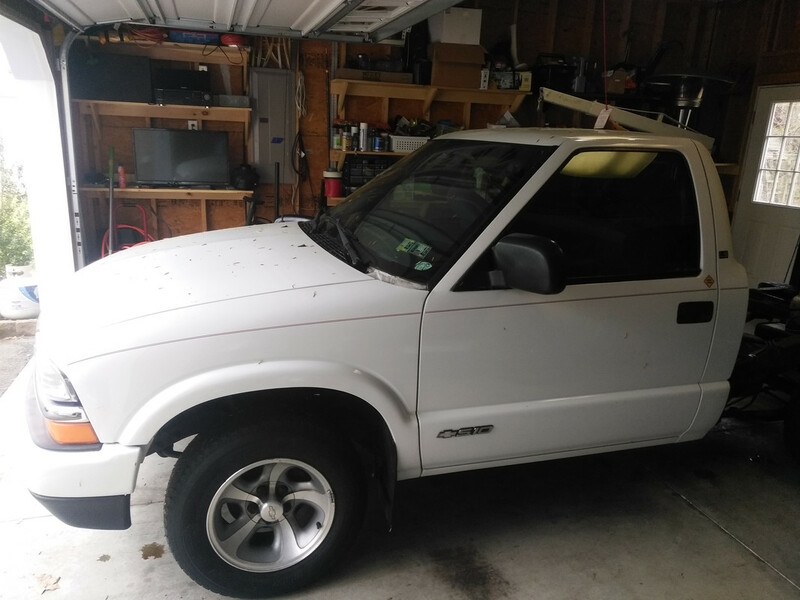 I picked up a 2000 standard cab s10 with no motor or trans for 700 bucks. it was originally a 2.2 auto truck. I then got my hands on a 2001 5.3 out of a Silverado and a 99 4l80 out of who knows what....thinking 2500 or 3500 truck. After tearing into the 5.3 it was awful looking inside, caked up oil under valve covers, everything leaked, the cam bearings felt like sand paper and the cross hatching was no longer with us. This was originally supposed to be a cam valve spring job and slap in..lol hahah. My 862 heads had some very small looking cracks in between the valves. I was told its not unusual and they would be fine to use by the machine shop, but that's not good for me so I had a set of ls1 heads laying around that are in really good shape. I cant remember exactly what number they are right now but the combustion chambers are bigger than the truck heads. So needless to say my block crank and heads are at the machine shop right now. I am getting the valves done on heads, honing block, polishing crank and he is installing my pac 1218 springs for me. The goodie list I have so far is pac 1218 springs, sloppy stage 2 cam, new lifters and trays, new rocker arms with trunion upgrade, texas speed stock length chromoly pushrods, shallower oil pan and another pocket full of money on gaskets knock sensors ect. I was looking at the summit brand domed forged pistons to make up for the compression loss.This truck is going to be part time street and a lot of track beatings. Im torn between a single turbo or a nitrous system. 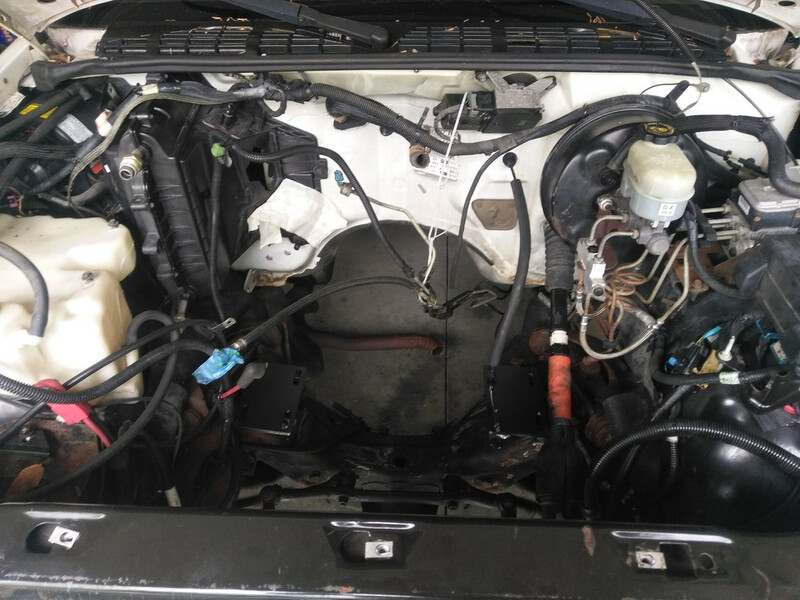 Sorry for such a long post but my questions are what tuning, front suspension, fuel pump, injectors, and headers(either nitrous or turbo) and what turbo or what nitrous system seems to be the flavor of the month. thanks a lot in advance. I live in Delaware by the way, and will be posting pics and updates of the build along the way. I was looking at the summit brand domed forged pistons to make up for the compression loss. You might want to talk to your machine shop before spending $500 on 2cc domed pistons. If they mill the heads and deck the block to assure they are flat you may gain back some of the 7 cc's you lost by going to the LS1 heads. You also want to consider the fact that turbos don't necessarily like high compression ratios to start with. It might limit how much boost you can run before you have to start pulling timing. Give one of the Turbo manufacturers a call and explain your project. Their sales or support people should be able to help decide what should or shouldn't be done. Thanks for the response. Do you know anyone that uses the summit brand piston? It looks like a wiseco to me. 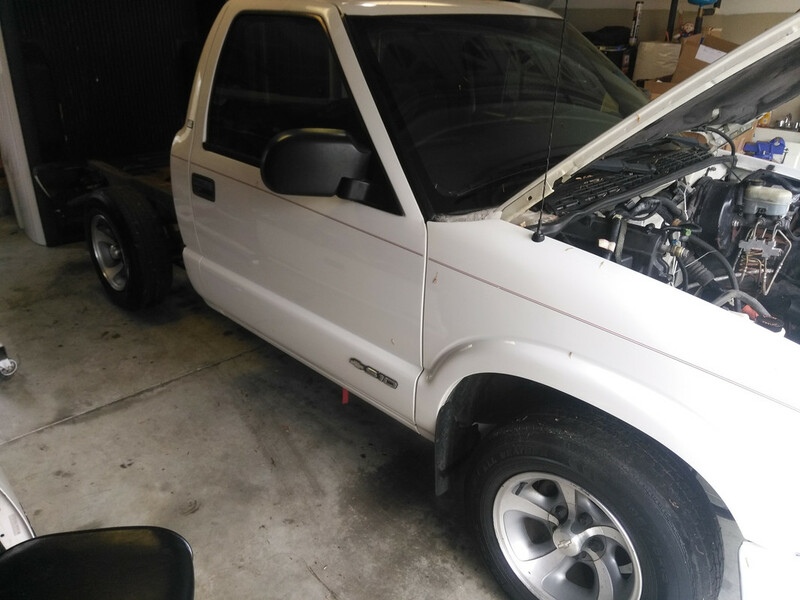 You should check out Boosted 6's build thread since he built a truck similar to what you want to do. 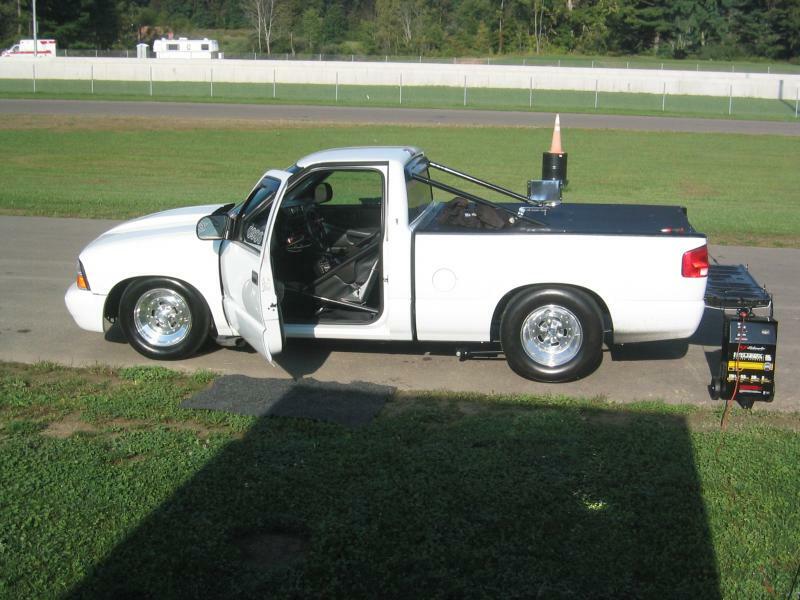 He ended up with a very fast fun truck. I'm not a fan of NOS, seen too much carnage from nitrous explosions. Even the pros have things go wrong and go boom. If you can't afford a turbo, can you afford to replace all the parts that get damaged when it goes lean and explodes everything? If you can't afford a turbo go NA and better parts. 500 hp is easily attainable with the right combo. I'm not in too much of a rush. I guess I could wait and save some more money for the turbo setup. My problem would be finding someone to do all the hot side work for me and not charge me an arm and leg. I took some pictures of my truck but haven't figured out how to post them yet. I took the bed off last night. 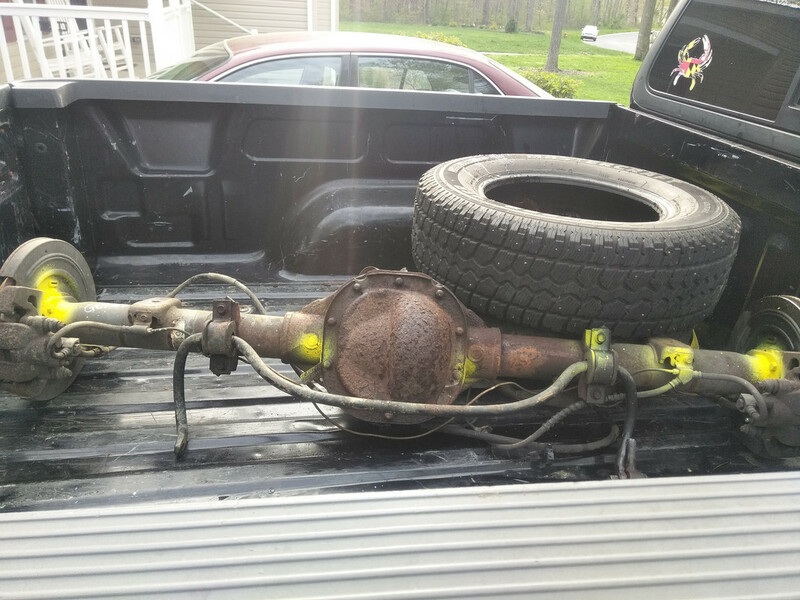 I went to a local u pull it in Maryland and didn't find the unicorn s10 8.5 rear I was looking for but did find 3 d4 axle code explorer 8.8s which are 3.73 Posi disc brake rears for 150 each. I think i am going to buy 2 of them incase 1 is **** and I'll steal the short side axle out of it. Since your going to be spending a lot of time at the track it would be a good time to put a cage in it. You say 10's but it only takes 150 HP to do that. Once you start you'll feel the need for speed. If you use postimage.org instead of Photobucket, your pictures won't have that stupid logo in the middle of them when posted on the forum. They also post the pics full size on their site and you can post that link also for things like wiring diagrams that get too small to read when posted in the forum. Or to better show detail. Also no ads on their website so everything loads faster. I've found that the Hot Link for Forms tag is the easiest to use....goes2fast likes the direct link...either way...no thumbnails. I would have suggested removing the frt clip as one piece, which you can still do to make easy to work on. I don't care for no fender-wells either. I will steal my wife's laptop tonight when I get off work and get you guys some pictures. I thought about taking the whole front clip off but didn't know if it could be done without messing with all the brake line abs stuff on the driver side. 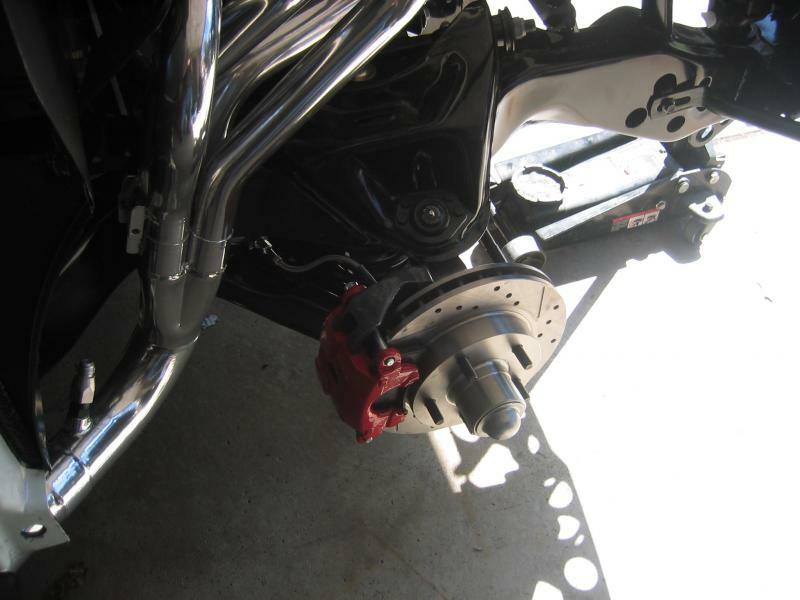 I will probably leave the inner wheel well out until I replace upper control arms and any other front suspension. Anyone have good recommendations for upper control arms shocks and coils for up front? My truck was originally a 2.2 so I'm guessing the stock springs won't be any good. Sorry for the crap pics. I took them with my Walmart phone in my garage. Once I get into actually doing things I will make sure pictures are better. 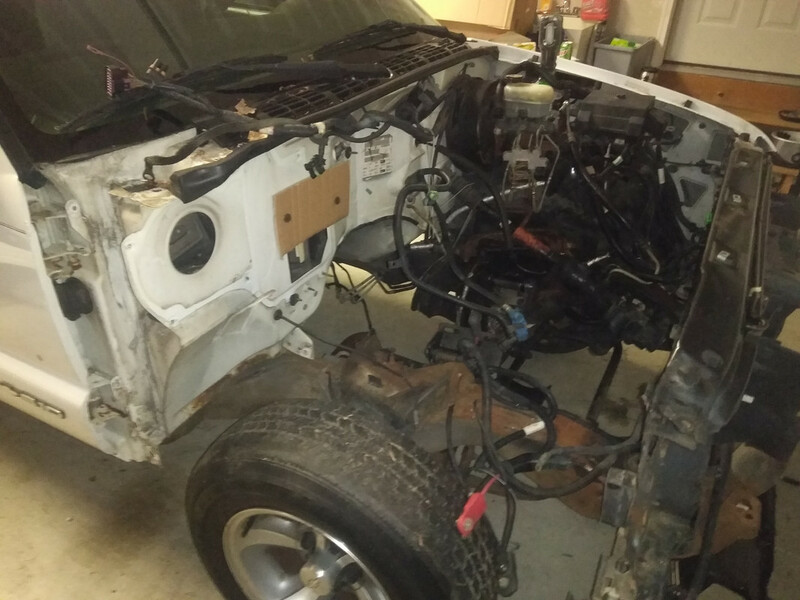 Let me know what you guys think.i have the bed off for fuel system and rear work thats coming soon. So are the rad supports underneath? And then it just pulls right out? I removed it in pieces so I could handle the pieces by myself. 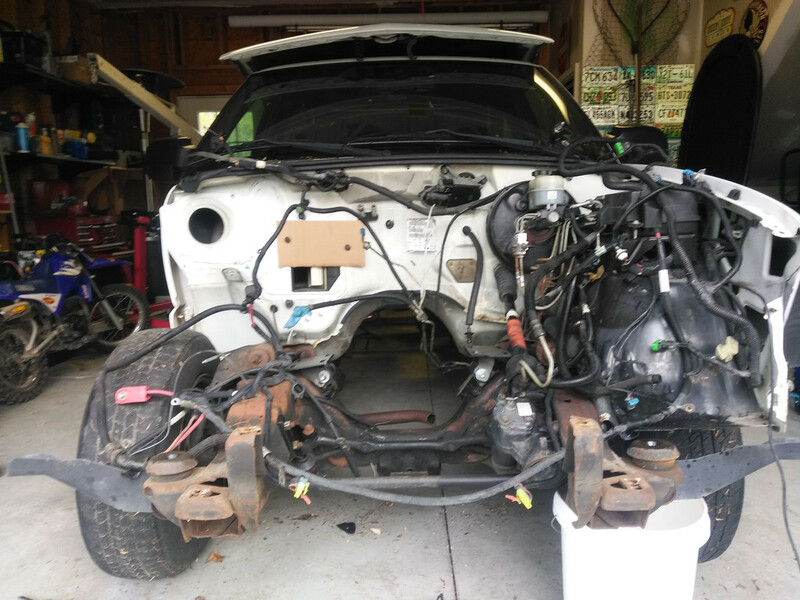 Pulled the bumper, grill & hood, unbolted and removed each fender leaving the inner fender attached to the fender, and finally the two bolts holding the core support. The stock upper control arms are just fine but if you feel the need go for it. Stock springs will do the job but way too stiff for me, ordered softer. Shocks are going to be your choice - I'm using Strange adjustable. That is one clean truck. I think i will take the whole front clip off for easier access. I always thought that the stock upper control arms interfered with headers and that's why alot of people used tubular uppers. The truck is surprisingly clean for being from the northeast. I see alot with rotted rockers and cab corners around here. If I get the front clip off tonight I will take some more pictures. Thanks for the info. I'm running new 4.3 moog springs with an iron block, bilstein shocks & a blazer sway bar. The ride is firm, but not harsh. 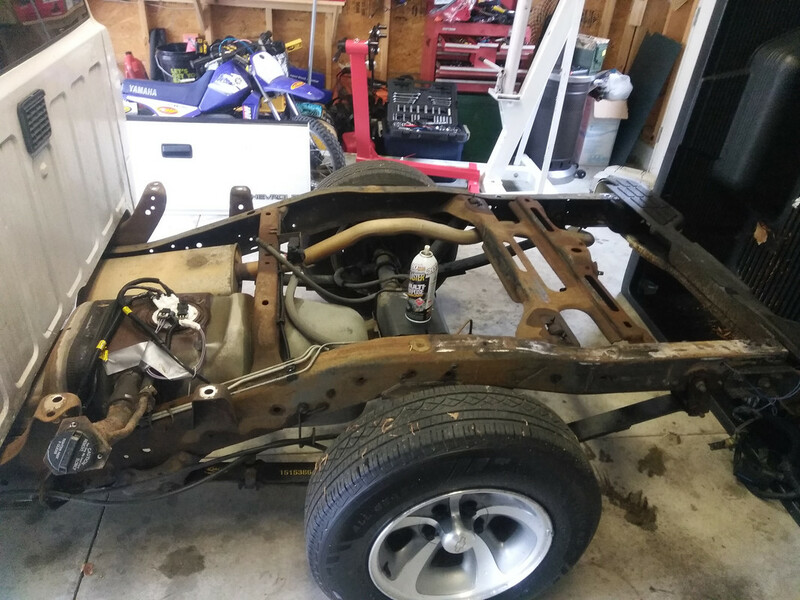 I rebuilt the entire front end and added camaro calipers & rotors while the sheet metal was off. Lilbowtie those are some slick headers. Are they custom or off the shelf? Lt1coupe you have a really nice truck also. I was hoping to have mine a little lower in the front so maybe if I bought new 4cyl springs that would put me an inch or 2 lower than yours. What do you guys think of 2.2 springs with ls? Why is everyone too lazy to learn how to post full size pics so we can see details? It is so mush easier to see what is going on if the pics are bigger both for asking questions and the answers. I know, but I don't get it this is the only forum that has this problem, so I keep hoping for change. That's what happens when Fisher Price equipment is used....lol. I decided I'm going to quit suggesting full-sized pics unless they ask....otherwise...I pass. Are my pictures not coming up big enough? Sorry it was my first time posting pictures on here. Should i use something besides photo bucket? I do need to get a good camera instead of using my phone. Did I just stir this guy up? I looked at a couple of his posts and he seems like he gets pretty upset about pictures. I'll postimage and see if that's better. No...but his point is valid. A picture taken several feet away and posted as a thumbnail doesn't leave much in the way of clarity. Thumbnails don't always enlarge when clicked on. I like postimage...no adds easy to use...allows multiple folders to file your pics. If you use postimage, I prefer the Hot Link for Forums tag....goes2fast likes the direct link tag. Either works. Try posting some pics in the Test forum and see what works best for you. If you have questions, post them up 'or use PM's and we can help you. Ok thanks. When I get home from work tonight I will give it a try. Thanks. Ok so this is the postimage gallery I just made real quick. Can you guys let me know if this works and pics are a good size. If so I will use this gallery from now on. No worky. When you click the "Share" button, it will come up with a list of options. Click on the far right side of the Hot Link for Forum tag...that copies it to your clipboard. In your S10 post, click "Edit" then "Paste. Well not too much happened tonight. I almost have the rad support out but my wife is at school tonight so I have a 10 and 6 year old to tame.. Lol. I am planning on picking up my 8.8 at the junkyard tomorrow even though my dad thinks the stock 7.5 will be fine and he also told me the 4l80 I have is overkill... I didn't know there was a such thing. I hope I got the picture situation straightend out. So tomorrow I will hopefully have pics of truck with rad support off and the 8.8 explorer rear. OK...I just went thru 5 of your pics and edited them. This is what they should look like when you choose the Hot Link for Forum tag. I left the last pic as a comparison. I can fix that one also...just wanted to show you the difference. This is pretty much where I left off tonight. No Problem man. If you need more help...let me know. BTW..you can still put more than one pic in a post. Just make sure to hit return/enter between pics. You can even enter text between pics if they need a little explanation. Much better, I can see what is going on now! 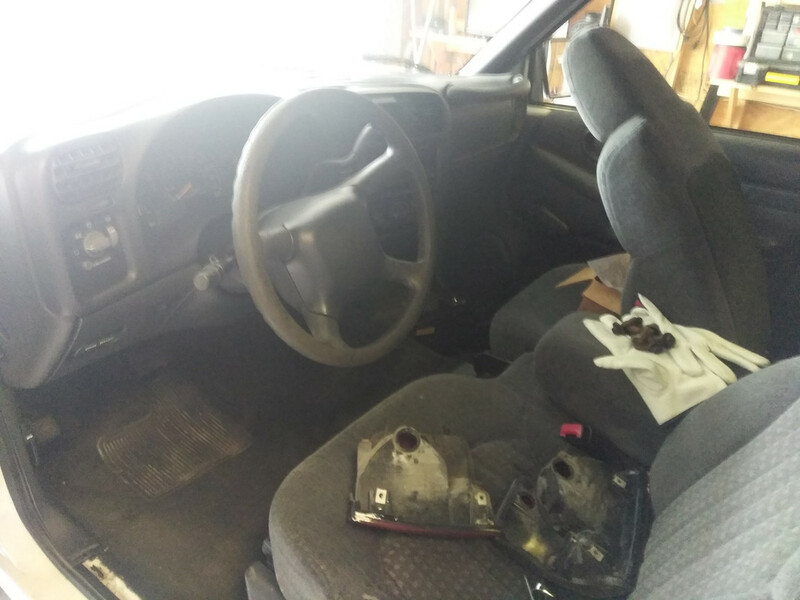 So I took the driver side inner wheel well out and managed to not have to mess with the abs box. I unbolted it at the wheel well and left the bracket bolted to the fender. 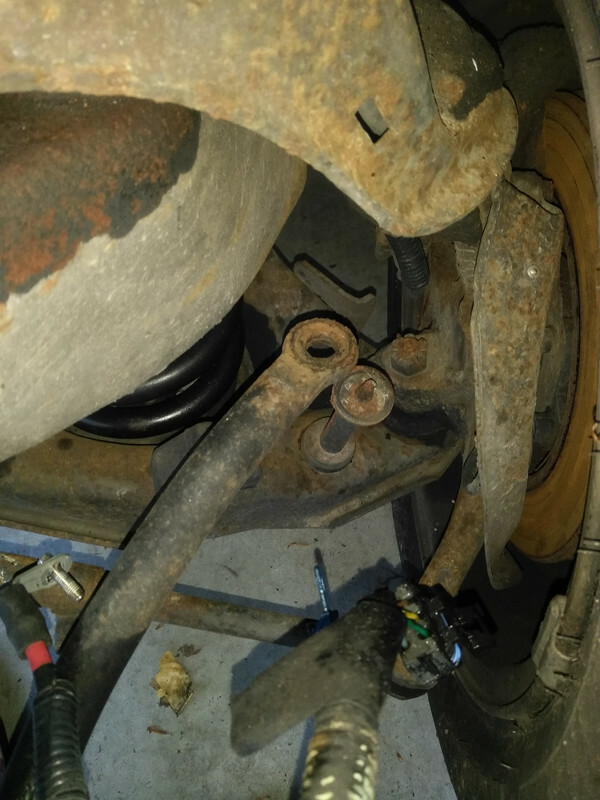 And as you can see my sway bar link is broken. I was planning on rebuilding from end anyway but this truck was tagged in 2018 so it was probably broken for a while. I also have a small update from the machine shop. I found some forged JE pistons that have a 7.5cc dome and will put my CR at 11:1 with a thinner head gasket and the quench will be perfect (whatever that means) .. I think he said stock was .55 or .51 compressed and this gasket is .39 or. 40. So obviously the turbo set up is not happening. He told me I should be easily at 500hp at the flywheel and be able to run pump gas. He also said that it will love a small shot of nitrous. So I'm figuring with a 150 or 200 shot I should be putting 550 plus to the tire which is plenty for me.